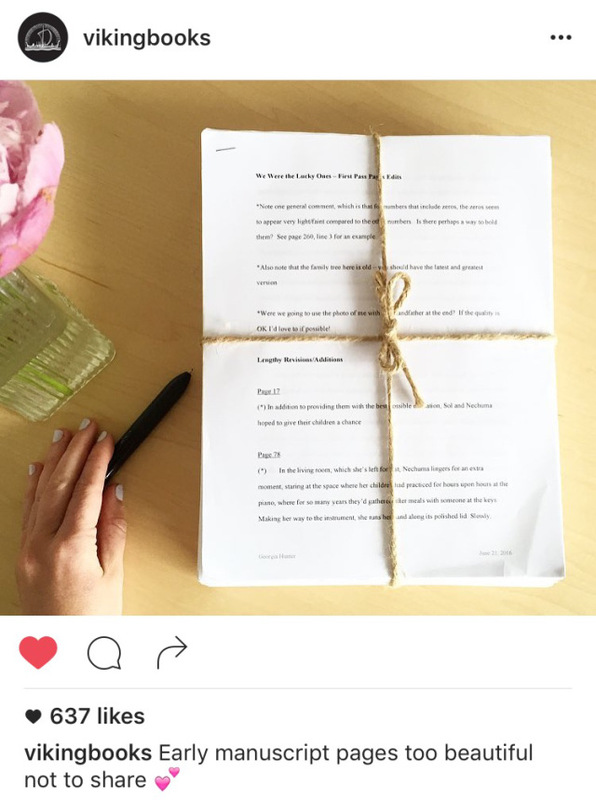 We Were the Lucky Ones has a launch date—February 14, 2017—yes, Valentine’s Day! The countdown to publication is finally, officially, on. February may feel eons away (especially as we’ve just dipped our toes into summer), but I’ve come to realize there will be plenty to report between now and then. Last week I had the pleasure of meeting with the publicity and marketing teams at Viking Books. We talked at length about my family, my research, and some ways we can begin building buzz around my novel through things like interviews and social media. I left blown away by Viking’s enthusiasm for my family’s story, and for me as a writer. At the meeting I handed over a final round of hard-copy manuscript edits. My agent, Brettne, snapped this photo. I took the train home to Connecticut with the same smile glued to my face, feeling 400 pages lighter. At the moment, Viking is in the process of finalizing what they call a galley, or advance reader’s edition of my novel—a paperback version that will go out to reviewers, well-known authors, bloggers, buyers, distributors—anyone who we hope might be open to giving us a quote about the book and/or helping us to promote the book as we get closer to launch. In a dream world, especially for a first-time author like myself, a galley would include a complimentary blurb on the cover. Brettne and my editor Sarah have sent my manuscript out to a few select readers for this exact purpose, and I’m thrilled and humbled and quite frankly still amazed to report that we’ve received two quotes, from authors whom I greatly (GREATLY) admire. Thank you, Paula McLain and Jillian Cantor, for not only taking the time to read my story, but for sharing such generous, heartfelt feedback. I cried (big, giant tears) when reading these for the first time. Truly, it is impossible to convey just how deeply indebted I am to these two authors! In other news, I just learned that Penguin Random House Audio has committed to producing an audio edition of We Were the Lucky Ones. So for those of you who (like me) enjoy listening to a story as you walk or drive or fly, you’re in luck. I’m not sure exactly when the audio version will come out, but I’ll certainly keep you posted. So please, someone pinch me! The galley, the blurbs, the team behind me as enthusiastic as I am to usher We Were the Lucky Ones into the world—it’s hard to believe sometimes that all of this is real. If only my grandfather and his siblings could be here to take part in the countdown, to know how overwhelmingly honored and excited I am to bring their remarkable story to life. 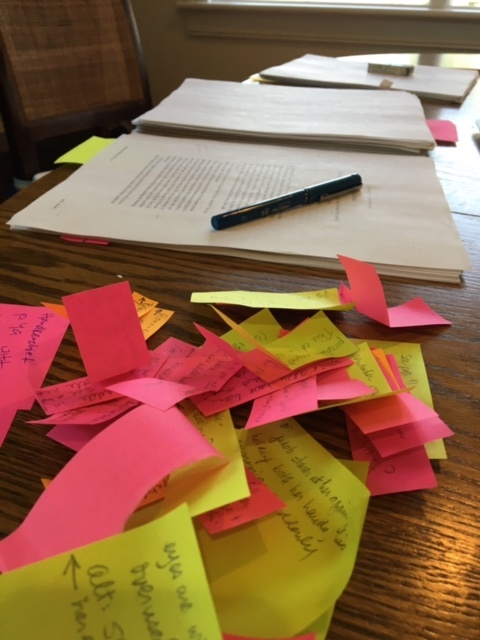 Part way through this last round of edits—made first with a pencil and sticky notes before finally inking them onto the pages. 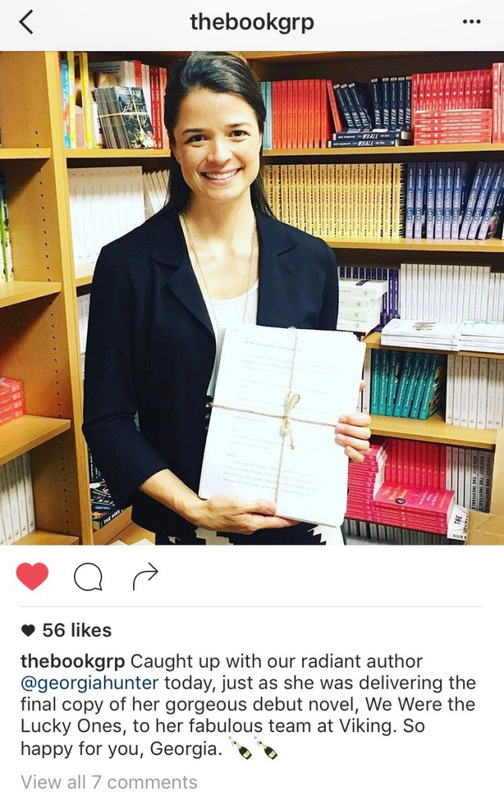 My manuscript highlighted on Viking Books’ Instagram feed!